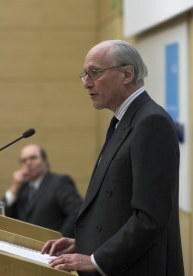 On Thursday 16th November 2006 the Centre for Public Law held the sixth in the series of lectures in honour of Sir David Williams. The lecture, entitled "The Rule of Law" was given by The Rt. Hon Lord Bingham of Cornhill KG, House of Lords. Lord Bingham posited, and then analysed, eight sub-rules comprising the Rule of Law. These pages offer the opportunity to listen to or download the lecture, to read a transcript, or to browse pictures of the event. The text of the lecture (with footnotes) is available to download (96kb PDF).